Autumn has certainly set in. It was cool at 14 degrees and the skies were dark with clouds. We decided that it wouldn’t dare rain on us so we set out. Having parked on Mill street in Streetsville we were right in the area where Timothy Street had built the mill in 1819 that got the town started. 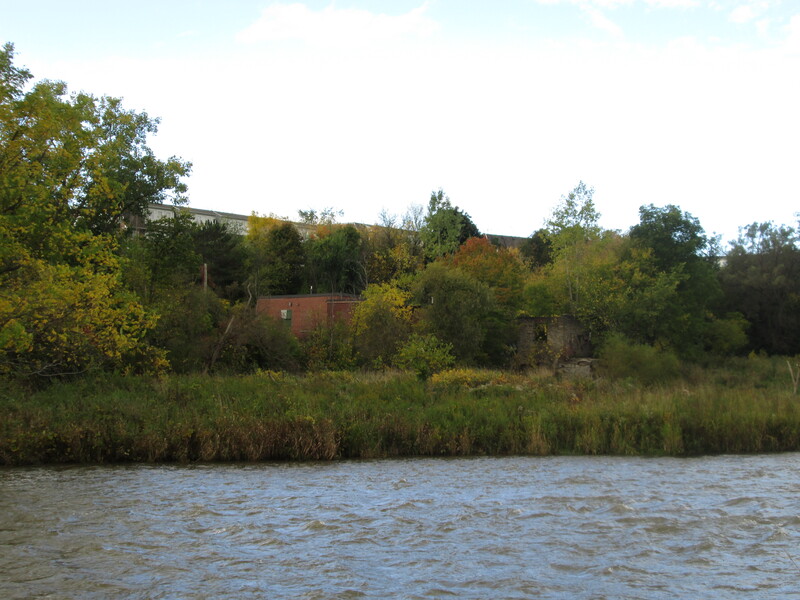 In 1818 the final parcel of land along the Credit River was ceded by the natives to the government. Timothy Street financed the task of surveying the area while Richard Bristol conducted the work. In exchange for his work Timothy was given 1000 acres of land which is now known as Streetsville as well as 3,500 other acres scattered throughout Halton and Peel counties. Timothy Street is listed in the town directories as a tanner. In 1825 he built the house in the picture below which looked out over his business empire. This house is believed to be the oldest remaining brick house in Peel County. 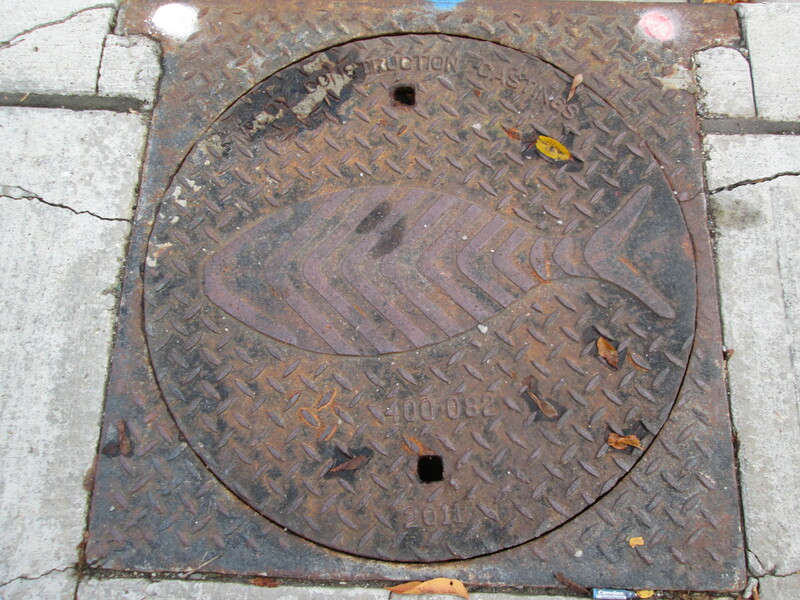 Access covers are one of many items that are usually dated and can therefore tell a little of the tale of a place. Main street crosses the Credit near Timothy’s house. At this point the name changes to Bristol Road in honour of Richard Bristol for his work in surveying the area. Access covers usually indicate the date on which a road or bridge was built or restored. The cover featured in the photo below is unique in the fact that it has a fish on it. Dated 2011 it came from St. George which is near Brantford. It is appropriate because this bridge is a suitable place to stand and watch the fall salmon run in the river. We didn’t see any this week because the river was too dirty and cloudy. From the west bank of the Credit River we had seen a set of foundations that we believed were another of the five mills that once lined the Credit River around Streetsville. We went north in Timothy Street Park along the Culham Trail. When we finally had a chance to check them out they appear to be a little less obviously mill foundations. 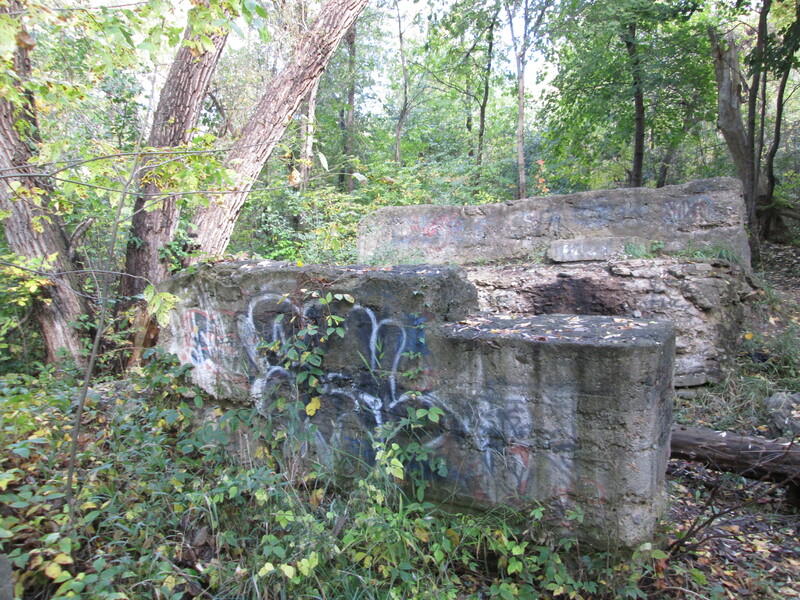 There are four thick concrete pillars which run in a slightly curved line with the first one beside the river, pictured below, having four holes formed in the side. The fourth one abutting against an earthen mound has a mounting surface on top of it. The mound behind it runs in a curved line off through the trees. The cover picture shows the four pillars from the side of the mound looking out toward the river. Large trees growing in places between them. Having visited the site it is hard to see this as a mill. It looks more like an unfinished roadway of some kind. 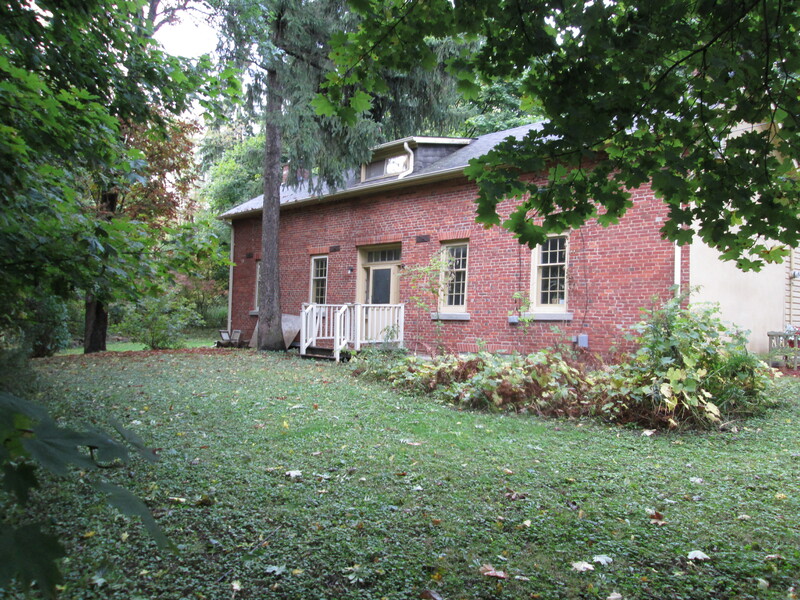 A member of the Streetsville Historical Society suggested that it may be related to Timothy Street’s mills but the use of concrete suggests a date around 1900 or later. The picture below shows the third pillar in the foreground and the fourth behind it. Notice the step down on the side of number three. The fourth one has a full ledge along the front as if something was mounted there. Forgotten by time and seemingly undocumented on the internet this project could be up to about 125 years old. Older bridge supports would likely have been made of cut stone and not concrete. If anyone has any information about this artifact please feel free to leave a comment. When we visited Riverside Park on Sept. 9th the wild cucumber were in full fruit. A seed grows in each of four chambers inside the cucumber. In the fall the bottom of the fruit literally pops open and the seeds are dropped out. The plant dies off every winter and relies on these seeds to carry on the following season. The fall is a time when many berries ripen. Several types of berries last on the bush and provide food for birds that spend the winter here. 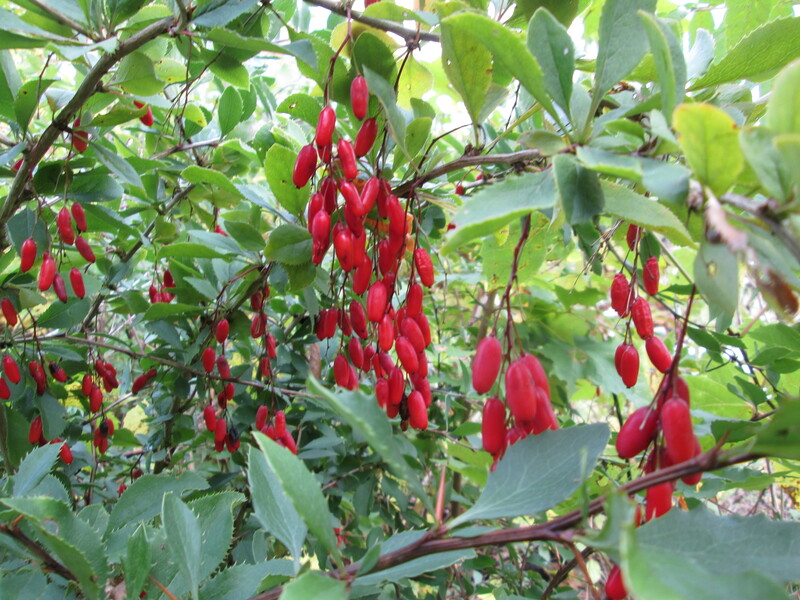 The red berries in this picture hang in clusters on a plant with serrated edged leaves. After looking through countless sites dedicated to berries in Ontario, I have to conclude that this is not a native plant and that it has escaped from a garden somewhere. One way plants can escape from gardens is when their berries are eaten and the seeds pass through the bird and remain viable. A seed that gets dropped in a soil condition in which it can grow may be found miles from the original plant. The male Bank Swallow chooses a colony to join. 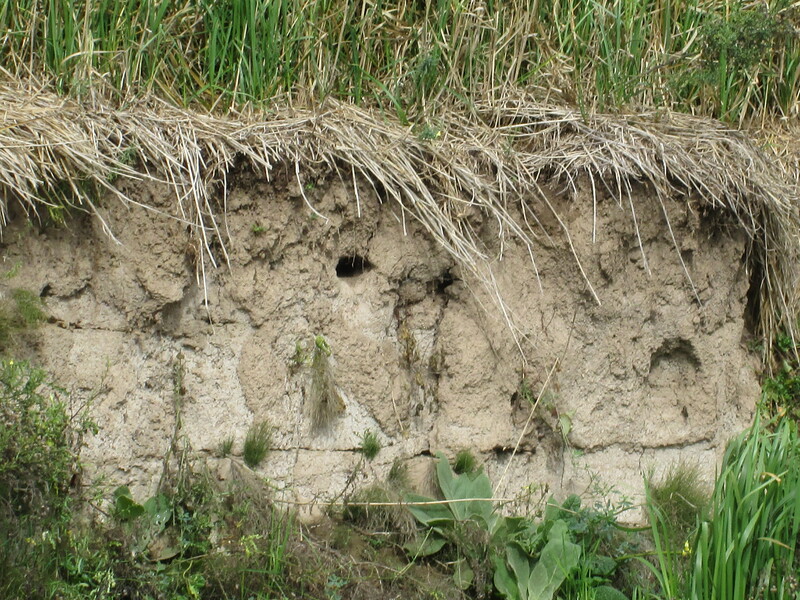 Colonies are founded in areas of loose soils for easy digging. The male will then select a site for his burrow which is normally about 2/3 of the way up the embankment to reduce access to ground predators. The tunnel will extend about 2 feet into the soil where temperatures are more stable and here a larger chamber will be dug for the nest. When the nests are complete, female Bank Swallows will hover in front of the nests to choose a mate. The female will then collect the grasses to line the bottom of the nest where she will lay her eggs. 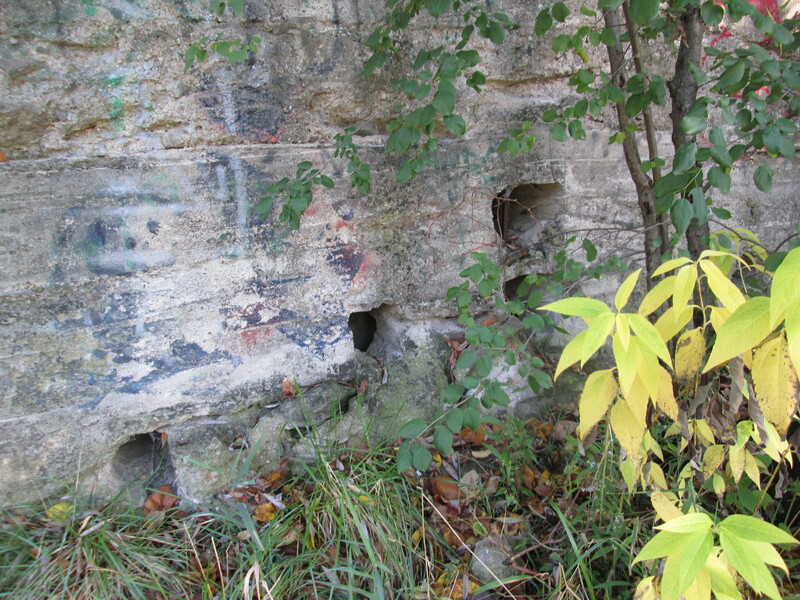 Several holes were seen along the river bank, one of which is shown below. 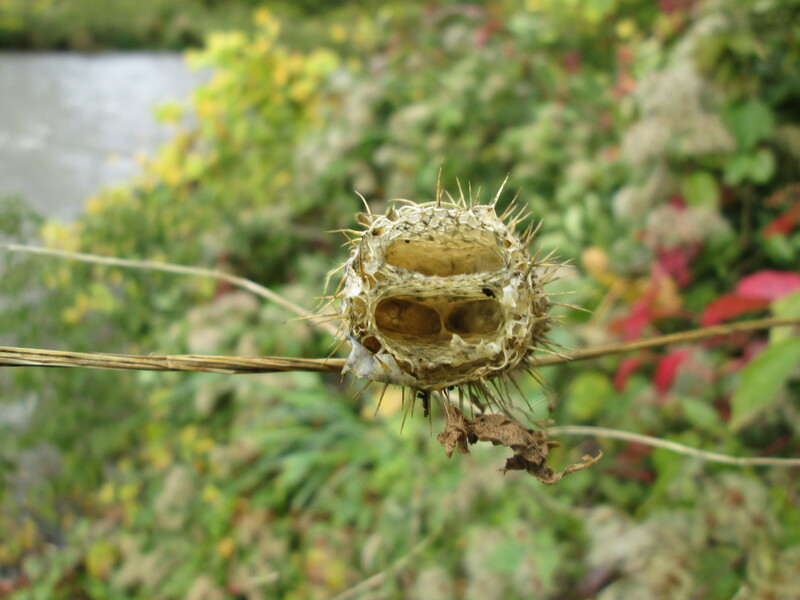 This entry was posted in Credit River and tagged Bank Swallow, GTA, Hiking, Misissauga, Streetsville, Timothy Street, Wild Cucumber on October 12, 2014 by hikingthegta.